How would you describe Nikkei cuisine to readers who are not familiar with it? 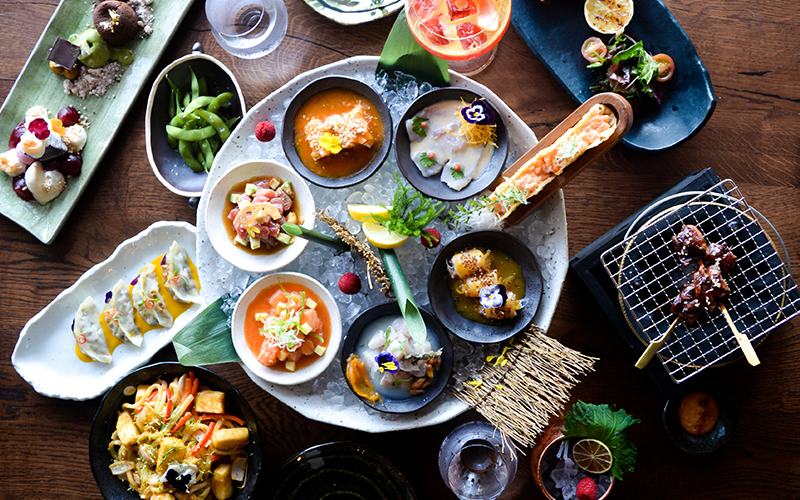 Nikkei food is the mixture of two cultures, Peruvian and Japanese. Nikkei borrows flavours, products, techniques and discipline from both cuisines and serves them on the same plate. When we talk about combining two cultures, for example we combine a classic sashimi cut fish with the “leche de tigre” from the traditional Peruvian Cebiche marinade and that makes a “Tiradito”. Another great example are the Yakitoris and Anticuchos in essence they are both skewers but we transform them to a Nikkei Grill by adding Japanese Miso and Peruvian Ají Panca or Huacatay Chimichurri and fresh Wasabi and the dish goes to another level. Nikkei cuisine has its origins in 1889, when thousands of Japanese labourers immigrated to Peru for work. How did the new type of cuisine evolve? The majority of the Japanese at that time were from Okinawa [an island off mainland Japan]. They were farmers and began to cultivate Japanese products on the Peruvian soil. The food began to evolve as they experimented with flavors by mixing them with Peruvian products. How important is culture in Nikkei cooking? It is very important, Nikkei food is not a trend, it is a culture, it is something with what grows and is transmitted from generation to generation. How has the cuisine evolved? It has evolved in the sense of getting more and more experimental. Many chefs are trying to adapt the cuisine to fit the palate of their guests. For all of us children born in Peru to fourth generation Japanese emigrants, we grew up with this type of food. It is the same flavours we have tasted since we were children but we are happy to be able to share it with the world and it makes us very proud to see people all over the world are embracing it. What is the most important skill to hone in Nikkei cuisine? Discipline. There is a Japanese proverb that says “Discipline, sooner or later, will overcome intelligence”. I think if you have the skill or the intelligence and you do not have the discipline to cultivate and improve it, it will not serve you.